Kava is steeped in tradition having been enjoyed for centuries. 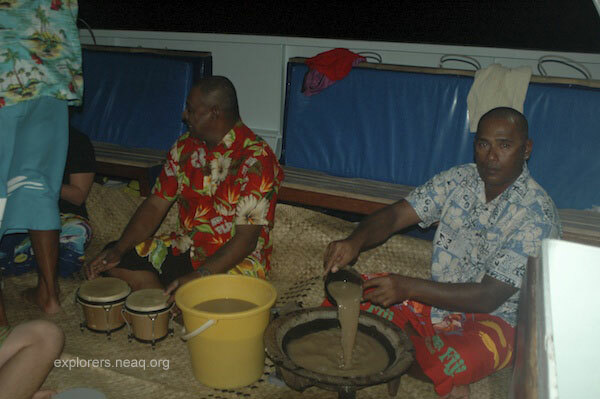 It is a drink that welcomes visitors, ties families together, is part of the pomp and circumstance associated with honoring someone, and, on the NAI’A, is a notable constituent of the nightly singing on deck for the Fijian crew (not much television watching out here). Simply put: it is mortar for cementing together the daily blocks of Fijian life. After drinking a quart or so, the effect is a slight buzz (and a need to deal with some internal hydrostatic pressure!). 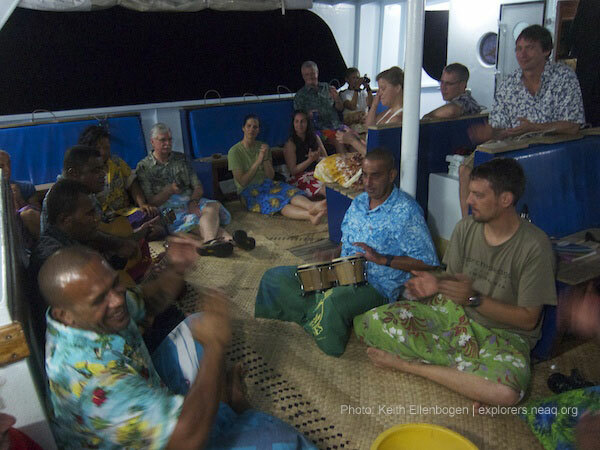 For Joint Aquarium Expedition first-timers, Kava Party’s dressing up in sulus (colorful skirts) and bula shirts (like Aloha shirts in Hawai’i), the big woven coconut mats spread on the deck floor, kava mixed in the traditional hand carved wooden bowl (tanoa) and served in a half coconut (bilo), and then lots of traditional Fijian tunes being sung. All of these elements combine to make an unforgettable introduction to the quaffing of kava. 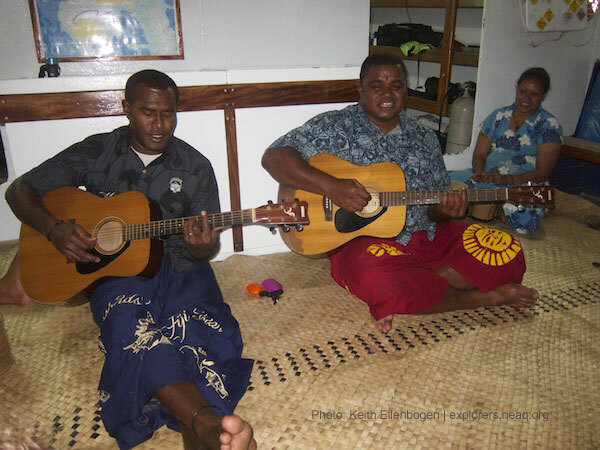 Mosesi Tuavuni, 12 year veteran of the NAI’A crew, chief divemaster and conversant in all parts of ship operations, plays the pivotal role in the music program onboard. He’s a talented guitarist, singer, master of ceremonies, and ambassador for team NAI’A. 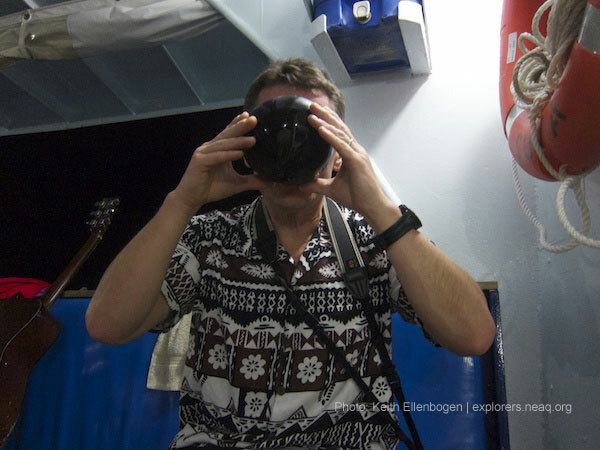 He makes Kava Party one of the most memorable events of the expedition, with participants commenting on past trips’ coming-togethers with complete recollection. When the bilo is passed to you, your single clap signals to all that you are ready to slurp down the half coconut shell’s contents with gusto. Three clipped claps once finished inform all that the bilo has been drained, and that you are part of the ‘kava clan.’ Then, repeat. And repeat again. And… well, you get the idea. Then there’s the part about kava dreams, once you finally turn in. Perhaps something about that later.